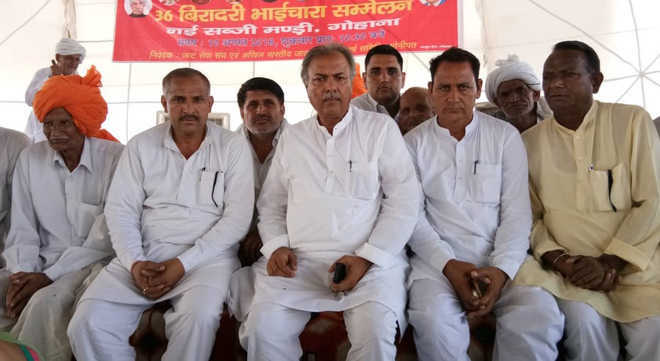 Akhil Bharatiya Jat Aarakshan Sangharsh Samiti president Yashpal Malik on Friday announced that Jats would not block roads, stage dharnas or came out of their villages in support of their demands for reservation. While addressing a district-level “bhaichara sammelan” at Gohana in the district, he said that they would devise a new strategy which would force the state government to accept their demand. “But, the new strategy will be announced in a state-level “bhaichara sammelan” at Jassia village in Rohtak district on August 12,” he said. He also announced that the agitation would continue till the withdrawal of cases registered against Jat youths and release of the youths from jails by the state government. Malik asked the people to know about the role played by BJP’s Jat leaders, including Finance Minister Capt Abhimanyu, Agriculture Minister Om Prakash Dhankhar and state president Subhash Barala.